Every year-end is a time for reflection and for strengthening the resolve we believe we’ve developed over the past year. But it’s also a mystery, a blank slate, a time to follow your senses where you believe you should go, a day to listen to some part of your insides that tells you what to do. I had meant to wake up at dawn and greet the new year with lights and festivities, but some years those plans are beyond your control. It’s not birth that has guided my thoughts this week, but death. I began a bucket list two days after Christmas, but within half an hour I realized there was little I wanted to do but catch a fish. I’ve never caught a fish, no matter how hard I’ve tried. The fish just seem to know when I’m coming and pick that moment to disappear. After musing on this list for several hours, I took out a yellow legal pad and began scribbling. I scribbled my soul on to the page. I learned how to laugh. I called some people I hadn’t spoken to in far too long. I actually picked up the phone when they called me back. I ignored my shoebox of receipts and my tax paperwork and the crack in my living room window. I danced the Charlie Brown dance with some people I love. And then I set to work on the mystery of life. My mother asked me to come up to her house to visit. After all, she gave birth to me on this day, so many years ago. It’s a special day for her too. My stepfather died last year, and she’s been putting his things in order, trying to make sense of what it is to be a widow. Last week, she found a small locked metal box up on a shelf in the corner of Frank’s office. She’s had a small set of his ancient-looking keys in a leather pouch sitting in her living room for the year and a half since he died, but no idea where they belonged. One key fit into the locked box. She turned the tumbler once round to the right and heard a clunk, but the box didn’t open. After three more turns and three more clunks, the top of the box popped up. Inside, we found the history of Frank’s escape from Nazi Germany, passports and travel documents, the telegrams to his family in New York, who anxiously awaited his arrival in the new world, a semi-secret painful past, one he seldom talked about but which couldn’t help but affect every step he took in a world that he’d once seen turned on its head. 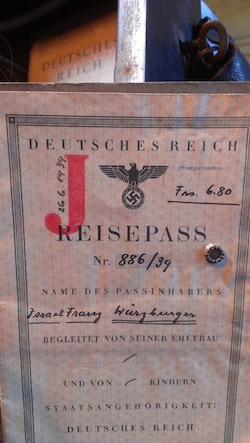 I’ve seen documents like these before, but only on television, only the documents that belonged to people who had been sent to the gas chambers. Never the documents of someone who’d gone on to live a good long life. I don’t know if Frank had any regrets when he died. I know he lived a life true to himself, not a life others expected of him. I know he had the courage to express his feelings. I know he stayed in touch with his friends. And I knew, as I lay his body out on the floor and began CPR, waiting for the paramedics to arrive on that sticky August afternoon, knowing he was probably lost, my tears falling on his cold face, that when my time comes, I won’t have any fears or regrets. I made that promise to him that day. It hasn’t always been easy to live up to it. Each new year is filled with mystery. There’s the mystery of chance. Why am I alive when a car could speed down the street and wipe me out, right now, with no warning? Why was I born on Long Island and not in Kabul? Where do the ducks go in winter? Why are all the pictures I take of sunrises, when none of them are of sunsets? And why, on a blustery New Year’s Day, was there a sign on the door of the New Suffolk post office that said the post office was closed, when the satellite-controlled door was wide open, tempting would-be mail felons? None of us know what 2014 will bring. And that’s the magic inherent in any new year. ← The Light at 4:37 p.m. Happy Birthday Beth! All the best in 2014. May all of your dreams come true, and all your wishes realized. Thanks very much, Mike. Happy New Year! Happy Birthday ! Linda & I started New Year’s morning at Orient Beach State Park where we saw a Snowy Owl & Snow Buntings. One of life’s little miracles. Sounds like Frank knew the value of freedom. It’s price comes with constant vigilance and a free press to keep us informed of THE TRUTH. That means your journalistic excellence is of great value to us all. Thank you, Rick. I’m sorry I missed the walk in Orient. It seems to me that you certainly are able to express your deepest feelings through writing. As I have mentioned somewhere before, you are very young…yet you have an old soul. You are sonorous and substantial and deep hearted. It certainly looks like you are living the life you desire; with this beautiful new website. Yes! Call the friends! Dance. The happiness will come in small moments. Slow down and remember that playing is as important as working although i feel at this point, you love your work, which is great. Freud said “the ability to love and the ability to work” is the source of happiness. You have everything you need. Especially courage. By the way…I once tried to save my stepfather with CPR and it didn’t work. You were lucky to have loved him so deeply and to continue to be surprised by him. Maybe that is another secret…to be open to surprise and newness. Have a great year Beth. Thanks for your writing and for your beautiful heart.